The last time I checked in on Oraya, in March 2013 (Oraya IRay Update 2: INTREPID Two-year Results Meet Primary Clinical Endpoint - Results in At Least 35% Fewer anti-VEGF Injections), the company had just announced the two-year results of the INTREPID clinical study, showing favorable results in requiring fewer anti-VEGF treatments to treat wet AMD. With the recent announcement (January 7, 2015) of a collaboration agreement between Oraya and Carl Zeiss Meditec, to provide funding to Oraya over a period of up to two years for the implementation of Oraya's growth strategy, and a report of the three-year INTREPID safety results last September, I decided to publish this update. First, the three-year INTREPID trial safety results. The three-year safety results were presented on September 13, 2014, at a EURETINA seminar where physicians also discussed their clinical experiences treating patients with Oraya Therapy. The three year safety evaluation consisted of detailed image analysis looking for the presence of microvascular changes related to radiotherapy. Although small localized changes were identified by the reading center in a quarter of the patients, they did not significantly affect vision. Commenting on the INTREPID study, Professor Ian Rennie, Consultant Ophthalmologist and Professor of Ophthalmology and Orthoptics and International Expert in Treatments of Ocular Cancers at Sheffield Teaching Hospitals NHS Foundation Trust said, "Of the cases I reviewed that were identified by the study expert panel as having microvascular changes attributable to radiation, most cases were so subtle that I would consider them clinically insignificant." The INTREPID study was the first to evaluate the safety and efficacy of Oraya Therapy in conjunction with as-needed anti-VEGF injections for patients with wet AMD, and is the only sham-controlled double-masked trial to assess stereotactic radiotherapy for wet AMD. The study met primary and secondary endpoints and showed that Oraya Therapy significantly reduces the need for anti-VEGF injections while maintaining vision in the presence of a favorable safety profile. A total of 21 sites in five European countries participated in the trial. Two-year results showed that a broadly inclusive cohort of previously treated Wet AMD patients continued to receive the benefits of a 25 % mean reduction in anti-VEGF injections over two years. Additionally, the targeted patient population maintained an impressive 45 % mean reduction in injections through the two-year visit, with stable vision. These impressive results coupled with increasing interest from physicians and patients, have led the Heart of England NHS Foundation Trust to become the second NHS center to install the technology. Patient treatment at the Trust was due to commence in October 2014. The Heart of England closely follows the Royal Hallamshire Trust in Sheffield, which began offering this innovative therapy in July 2014. The commercial use of Oraya Therapy has been rapidly expanding in Europe, with the treatment available in a total of eight centers (see note below) across the United Kingdom, Germany and Switzerland. It is covered by insurance in all three countries. On January 7, 2015, Carl Zeiss Meditec AG and Oraya Therapeutics, Inc. (Oraya) jointly announced that the companies had entered into a collaboration agreement under which Carl Zeiss Meditec will provide funding to Oraya over a period of up to two years for the implementation of Oraya's growth strategy, and in turn receive rights in the company reaching up to a majority stake after two years. The Oraya Therapy is available commercially in Germany, the UK and Switzerland, and the collaboration is intended to accelerate and expand these initial European market developments. While specific terms of the agreement were not disclosed, the companies noted that Carl Zeiss Meditec will be making a meaningful strategic investment in Oraya, and that further opportunities to leverage the companies' respective technical and market expertise and resources will be reviewed. In discussing the transaction, Dr. Ludwin Monz, President and CEO of Carl Zeiss Meditec AG, stated, "The current pharmaceutical treatment regimens for wet AMD are exceptionally costly and burdensome, and Oraya's unique therapy offers a significant potential to positively impact the management of this debilitating disease." He went on to add that, "ZEISS has a long tradition of bringing new and innovative technologies to the ophthalmic market, from the earliest slit lamps, to category leading products such as glaucoma field analyzers, Optical Coherence Tomography (OCT) and innovative femtosecond laser platforms. These types of technology innovations, all offering significant provider and patient benefits, are part of the core strategy of Carl Zeiss Meditec AG." Commenting on the agreement, Jim Taylor, CEO of Oraya, stated, "It is exceptionally rewarding to have the support and validation that are inherent in this commitment by Zeiss, a company universally recognized for its commitment to excellence in science as well as in patient-focused and physician-focused products and innovations. As a result of this collaboration, we have effectively enhanced our potential to positively impact patient outcomes, while significantly reducing the therapy burden for clinicians and providers as well." 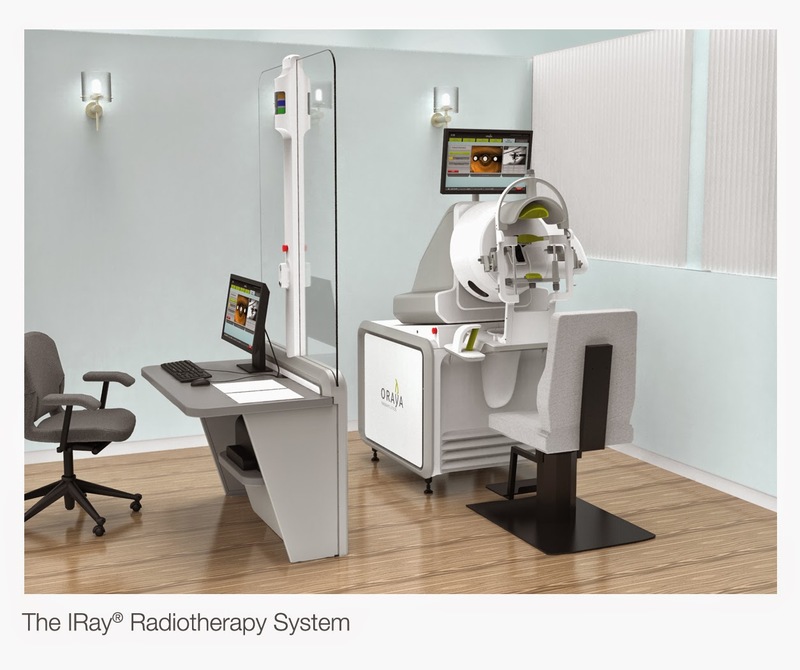 In the USA the Oraya IRay is still an investigational device and is not yet available for sale.